As a physician, you care about safety, and you are happy to take precautions to protect both yourself and the ones you love. Seatbelts, bicycle helmets, and life jackets are always worn at the appropriate time. You would not dream of leaving those you love vulnerable when it’s so convenient to protect them. Life insurance can be the same; it offers straightforward protection that is convenient and surprisingly affordable. When you consider all that life insurance can do for your family (and even your medical practice), you’ll likely agree that securing it is the only sensible choice. Some physicians are not adequately insured, and they overestimate the cost and difficulty of securing life insurance. Yet, life insurance is usually quite simple to obtain. In many cases, all you have to do is answer some basic health questions and you can receive a quote. The best time to buy a policy is when you are young and healthy, but even if you have a few minor health concerns, you may still be able to get valuable coverage for your loved ones. Life insurance also offers immediate protection. Once your policy is secured, your family has a significant financial safety net in place. This allows you to relax, knowing that if something should happen to you, your family will be secure. They will be able to stay in the house you shared together, their expenses will be paid, and your children will be able to go to college. If it has been several years since you last obtained a life insurance policy, now is the time to look again. Many families are surprised to discover that their needs have changed significantly. For example, are you and/or your spouse now earning more? Have you added to the family? Have you moved or upgraded your home? It makes sense to periodically check your needs to make sure your family will be secure if something should happen to you. Naturally, most people think of protecting their children and spouse when they think of life insurance. But life insurance can do more. Life insurance can protect your business too. If you are securing a loan, the lending institution may require that life insurance is secured with the bank as a beneficiary of the policy. Or if you own a medical practice and have partners or investors, life insurance can help protect your financial interests through a buy-sell agreement. There are several ways you can structure this protection. One of our experienced advisors can walk you through the options. It’s time to contact a TMA Insurance Trust advisor and request a life insurance review. At no cost to you, an experienced advisor will take a few minutes and review your current information. If you own a practice, you’ll be able to discuss how life insurance can help protect the personal interest you have in your medical practice. Our advisors are salaried and do not earn a sales-based commission, so you can trust that their recommendations will be in your best interests. 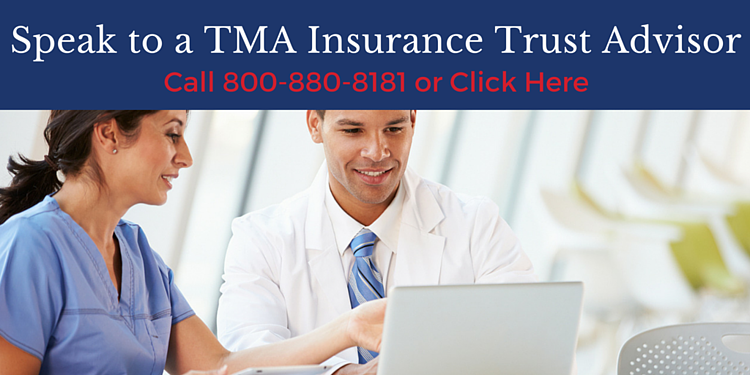 TMA Insurance Trust has now made it easy for TMA members to obtain up to $500,000 of *TMA Member Term Life Insurance issued by The Prudential Insurance Company of America through an online enrollment platform with simplified application. In many cases, there is no physical exam required. You can apply for TMA Member Term Life Insurance issued by The Prudential Insurance Company of America at any time online. To get started, click here. This offer is only available for TMA members.